Description: The Definitive Versions of Blue Note on XRCD24... Listen & Compare! Audio Wave Music presents Blue Note on XRCD for the first time! Audio Wave Music was created by the CEO of XRCD's US distributor Elusive Disc with a goal of providing the finest presentation of the Blue Note label's classic jazz recordings on the ultimate compact disc, XRCD. They joined forces with the legendary producer Joe Harley and mastering engineer Alan Yoshida, and followed the strict and time-consuming XRCD protocols in all aspects from the digital transfer of the original analog tapes to the physical production of the CDs. The new XRCD editions SMOKE all other Red Book CD versions, including those remastered by Rudy Van Gelder himself. The XRCD version is much more analog-like with natural, warm tonality, better resolution of details and micro- and macro-dynamics. Older CDs, on the other hand, sound compressed, veiled, boxed-in, and harsh and shrill. In fact, the XRCD is very, very close sonically to the superb Music Matters 45rpm vinyl editions. 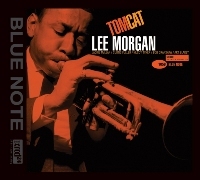 If you are a fan of Blue Note and an audiophile, you MUST own the entire series of 25 titles! XRCD is compatible with ALL CD PLAYERS and requires no special equipment! Rudy Van Gelder's original Blue Note 2-track analog tapes were meticulously mastered to XRCD by engineer Alan Yoshida and producer Joe Harley. The highest quality analog to digital transfers from tape to CD... Listen and Compare! Deluxe hard-bound book style packaging with original liner notes and high resolution B&W session photos. Originally released in 1980. This XRCD24 released in 2010.